Semiconductors are key components for the Internet of Things (IoT). They connect the real with the digital world now evolving to cloud services and artificial intelligence (AI) functionality. Infineon Technologies allows for easy and secured use of new generation sensors featuring new AI functionalities running on Amazon Web Services (AWS). 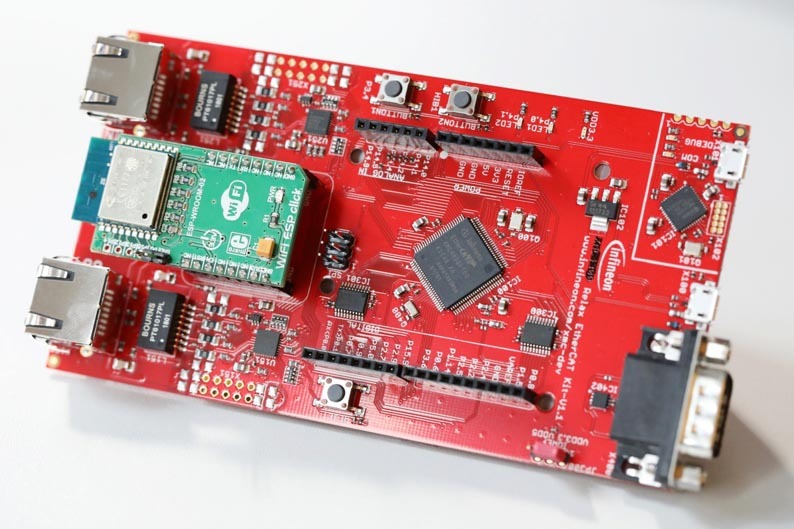 The Evaluation Board XMC4800 IoT Amazon FreeRTOS Connectivity kit Wi-Fi. Infineon’s XMC4000™ family of 32-bit-microcontrollers now supports Amazon FreeRTOS, a microcontroller operating system that makes small, low-power edge devices easy to program, deploy, secure, connect, and manage. Key success factors for IoT comprise hardware-based security solutions and industry-leading sensor technology. With their smart interplay, multiple new options of edge-computing based applications for consumer and industrial markets are enabled. Securely connecting manufacturers’ devices both locally and to the cloud is paramount for customers to take up the connected service offering. People living in smart homes and working in smart buildings can benefit from the seamless interaction of the new generation XENSIV™ sensors. Radar, pressure sensors and MEMS microphones are accompanied by OPTIGA™ hardware security solutions. Infineon-enabled solutions in energy, light management, health care and building operation running on AWS can improve the quality of life and deliver substantial cost savings. For example, Infineon’s XMC4800 family Connectivity kit Wi-Fi runs on AWS. This development platform brings edge-computing services to the next level of interaction in customers’ applications, including Wi-Fi connectivity and EtherCAT. “Using the XMC4800 series, Infineon has the opportunity to be one of the first movers in the market offering AWS FreeRTOS combined with EtherCAT functionality,” said Ralf Koedel, Director Product Marketing for Automotive & Industrial Microcontroller at Infineon. The Evaluation Board XMC4800 IoT Amazon FreeRTOS Connectivity kit Wi-Fi is available.